We think this camera is super cool. 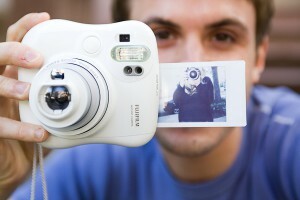 Fuji’s Instax Mini Instant camera is “polaroids little brother” and lets you take digital photos and print them instantly. With a nice retro finish and everything. Wouldn’t it be sweet to be at a party, shoot some photos and then instantly hand over a credit card sized photo to the persons in the photo to put in their pocket? Yes. Yes, we think so.